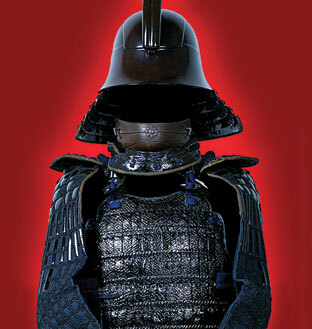 Through more than 160 objects–armor, weaponry, paintings, lacquer ware, ceramics, costumes, and more–this special exhibition explores the principles that governed the culture of the samurai lords. Nearly all of the objects in the exhibition are from the collection of one of the most distinguished warrior clans, the Hosokawa family. This collection is housed in Japan’s renowned Eisei-Bunko Museum in Tokyo and in the family’s former home, Kumamoto Castle on Kyushu island, Japan. Seven of the artworks on view have been designated Important Cultural Properties, the highest cultural distinction awarded by the Japanese government. Three of the artworks are designated Important Art Objects, another prestigious distinction awarded only to the works of notable artistic and historical significance. As I understand it, everything was going along well — nice reviews, etc. — until very recently, when someone(s) started a blog parodying the museum’s website. Calling the show “Lord, It’s the Samurai” and labeling the museum “orientalist,” the website — Asians Art Museum — is very clever. Enter the world of the samurai, where more than seven centuries of martial rule are reduced to a single Disney-like trope of gentleman-warrior myth. Military prowess meets Cultural connoisseurship inan ideal of masculine perfection — selling militarism as beauty in a time of war. I’m rather glad I’m nearly 3,000 miles away. But here’s the question posed by a reader of Real Clear Arts: what should the museum do? The website, after all, is anonymous, so far — and the curators can’t talk with its creator(s). In response, the museum has started a blog — an Invitation To A Discussion — on its own website addressing the issues. Not a bad idea. But is that enough? Too much? Would ignoring the parody have been smart or foolish? Does a small(ish) museum like the Asian Art Museum have to react differently than a big one like the Metropolitan? Over to you, readers — and over to AJ’s PR expert, Amanda “Life’s A Pitch” Ameer, who just posted on blog etiquette, which is close enough. Photo Credits: Courtesy of the Asian Art Museum (top) and Asians Art Museum (bottom). I visited the website and blog in question, and it looks like they have an actual Dialogue section on their blog, and that their e-mail address is readily available. So it appears that anonymity has nothing to do with the ability to be contacted and engaged with in dialogue. I wonder if the false conclusion that they can’t be talked to isn’t part of a PR move by the museum to contain the resulting discussion to their terms: their moderator, their staff bloggers, and their built-in sympathetic audience. The producers of the site are indeed “reachable” and are indeed also “anonymous” – they would not give their names when they did an e-mail interview with the SF Bay Area website http://www.8asians.com. They answer the question of anonymity there. The question of “what should the museum do?” seems to be resonating. A curator from a major museum has responded (posted on the parodists’ blog), echoing the scholars’ concerns referred to in the comment by Art Phan, and suggesting that the points be taken up at a larger meeting of Asian Art curators. It all seems to underline the original question: is the museum-run blog page enough, in this case to answer the questions and concerns of scholars, curators, and the original critics? Now officially sanctioned by the academy . . .
as part of a speaker event along with UC Santa Cruz American Studies professor emerita Judy Yung, who will speak about her forthcoming book Angel Island: Immigrant Gateway to America. The Los Angeles Times reports today on how mention of the samurai spoof continues to send the museum’s director “simmering,” even nine months after. Sadly, what might appear to indicate effectiveness on the part of the spoof is actually belied by the fact that this museum continues to produce exhibitions such as the current Shanghai show, which, as the Times reports, has drawn accusations of “muddle-headedness and superficiality” and was roundly panned by SF Chronicle’s art critic Kenneth Baker. It only confirms that the museum has learned virtually nothing from the whole “public brouhaha,” that despite the wide recognition of need for meaningful change by scholars and museum professionals around the country (e.g. a curator, an educator, even a volunteer), commercial dogma continues to rule the day. Museums are supposed to be sites of knowledge production, yet this one produces instead an endless stream of imagery of objectified Asian bodies: “The Timeless Oriental”—whether they be women in cheongsam or kimono, or men as martial artists, monks or samurai—that no amount of public embarrassment seems to have any effect on. Read more in response on our blog. Bad luck… A year too late. Do you know if this show comes back? 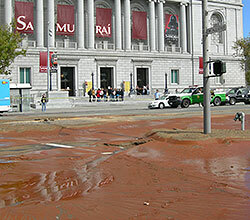 As a nice footnote to this story, the “Asians Art Museum” guerrilla intervention project is detailed in a new book: The Routledge Companion to Museum Ethics: Redefining Ethics for the Twenty-First Century Museum, edited by Janet Marstine, in a chapter/essay titled “Museum Censorship” by Christopher Steiner. Published June 2011.